Tom Hanks is a master of comedy. He is a person, who hasn’t an easy childhood, but became popular and reached Top Best Actors. He started his acting career in the community theater, where he had had an audition. 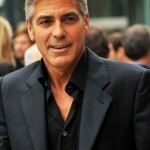 The director of the theater invited him to Cleveland and his career of an actor started there. His early films were of great success, some of which are still regarded as hits. One of the greatest Hank’s works was a fantasy comedy Big (1988), establishing him as a main talent of Hollywood and being nominated for the Academy Award for Best Actor. His comedic roles of the highest quality soon were extended to dramatic ones, though he never left humorous movies. Another great success was Philadelphia. He has never had any problems with weight. It is only his profession that made him experiment with it. In this film he played a lawyer with AIDS. For this role he had to lose 35 pounds and thin his hair to look sick. 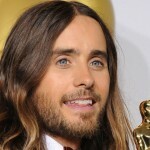 His performance in the film was charming, so no wonder he won the Academy Award for Best Actor for his role. He was filmed in many wonderful movies, every of which had its demands. Next time he had to have weight transformations was in 2000. He acted as a system analyst guy from Memphis, who had to fight for his life on the island in the Pacific Ocean after a plane crash. 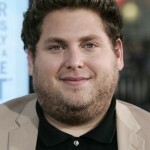 He must have looked like a middle-aged man, so he was made to put on 50 lbs (23 kg) before the film production. 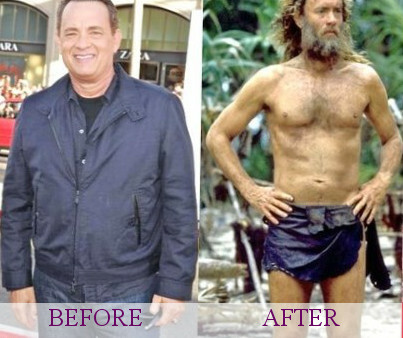 This was for his scenes before the crash, but a real challenge was four months, when he was losing these 55lb with a diet and tough exercises together with the forbiddance to shave or cut his hair. He returned in his previous shape due to a special diet, which we have a chance to look through. 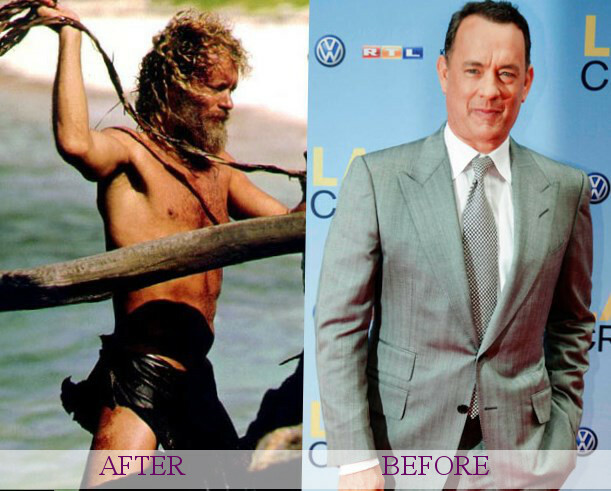 He followed the Castaway Diet and ate only crabs, fish, vegetables, a little carbohydrate from fruit, drank coconut milk and water. If he had been hungry, he consumed large quantities of vegetables. The size of meals fitted in his palm, that is too little for a man of 1.8 meter height and it wore him down greatly. All this food went with 2 hours cardio training six days per week. But all his struggles were not useless as he won a Golden Globe for Best Actor and an Academy Award nomination for his portrayal of a marooned systems analyst in Robert Zemeckis’s Cast Away. All these dramatic weight fluctuations for film roles could be the reasons that he was diagnosed with type 2 diabetes in 2013. He admitted in the interview that this disease might have been caused partially because of weight or his predisposal to it. He stated that he would no longer gain or lose weight for work as it could be very difficult for the body of the man, who stepped over the age of 50 years. Now he is in a good condition, gets regular exercises and eats right and, of course, takes certain medicaments. 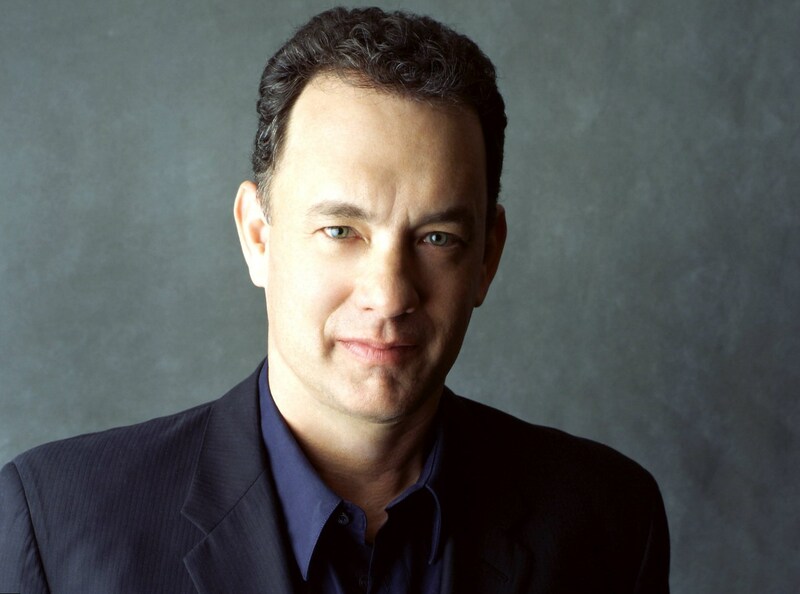 Tom Hanks is a bright example of a professional actor, who is ready for great difficulties in order to do his job at the highest level. He is not the only person who had to experiment with weight because of work, but his great diligence resulted in movie masterpieces and a number of awards.